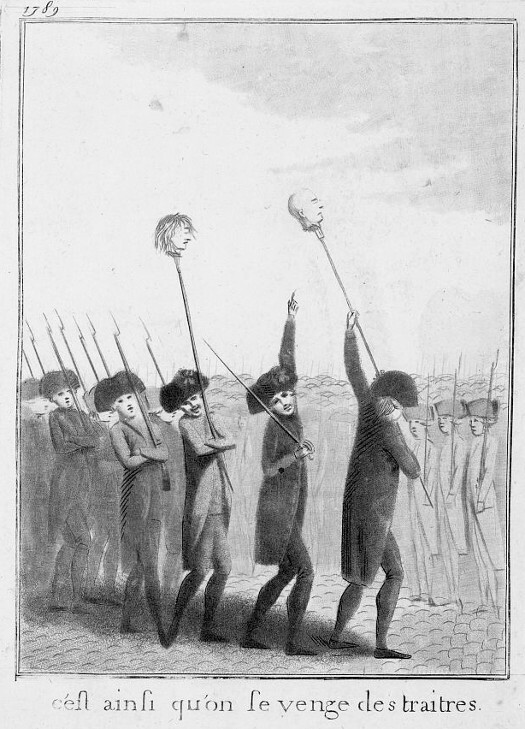 Above, an engraving, c. 1789: militia hoisting the heads of Flesselles and the Marquis de Launay on pikes. The caption reads “Thus we take revenge on traitors”. Last night on BBC4 between 10Pm and 11PM the BBC broadcast a repeat of a programme it first broadcast on BBC2 on Thursday 9th Feb 2017 between 10Pm and 11PM. It was a documentary that had two titles: It was publicised as “After Brexit: The Battle for Europe.” But could only be found on the BBC’s iPlayer by typing “This World” which would then refer the viewer to This World – After Brexit: The Battle for Europe. In other words, the Brussels Brainwashing Commissariat was being remarkably coy about one of it’s own productions! One only had to view the programme to realise why! Because the BBC’s Europe Editor, Katya Adler asked whether the EU can survive the biggest challenge in its history! The programme was a credit to the professionalism of Katya. She delivered a broadcasting journalistic performance as it should be delivered showing no party bias yet not being anodyne. Throughout the programme however Katya disclosed parts of her upbringing and background. Born in London of German parents, raised for part of the time in Tuscany, this graduate of Bristol university this clever multilingual lady (in addition to English, she is fluent in Italian, Spanish, German and French, and has learned Arabic and Hebrew) could well describe herself as a European should she so wish. And would be fully justified in doing so. As the BBC’s bosses reviewed the programme prior to it’s first broadcast they must have been somewhat depressed for as Katya toured the various troubled places and interviewed those she did the message was clear: the European Union was facing a most severe challenge to its very existence. This challenge is economic and political. Like previous such challenges that have brought down empires and nations before the challenge, or revolution, generally has two components: economic and political. Both are generally interlinked, and in many cases there is a sort of “chicken and egg” debate about which component caused the problem. As in so many cases before the answer is: Both. The European project was born out of a dream. To unite Europe politically to put an end to the conflicts that had ravaged the continent for centuries. In the UK, it is this dream that motivates the Liberal Democrats and Europhile Labourites. Central to this was the Euro. Tragically (for the Europhiles) the conception and birth was flawed. The Eurozone was created with a single currency but not a single monetary policy and a single fiscal policy. Crucially, each Eurozone member had authority and ownership of it’s own sovereign debt yet each was jointly and severally liable for all such debts! Now whilst the BBC may be coy about publicising this excellent programme, British Gazette readers will no doubt be pleased to learn that their Editor has no such reservations! If the reader has what is known as a “smart television” they may well be able to watch the programme via the BBC iplayer on it. It is available for 29 days from today. The duration is 59 minutes. Of course two election results have shaped the current situation in Europe. The first was the Brexit vote on Thursday 23rd June 2016. The second was 8 th November 2016 and the election of Donald Trump as the 45th President of the United States. The first is on Thursday 23rd February in Stoke on Trent when Paul Nuttal might be elected as the new MP. This would certainly send out some shock-waves, a little of which will reach Holland. The second is on the “Ides of March” when Geert Wilders, Leader of the Partij voor de Vrijheid finds out what lies before him following the General election on Wednesday, 15 March 2017. Opinion polls taken before the election showed PVV competing to be the largest party. However, all the other main parties ruled out forming a coalition with PVV, which would make it virtually impossible for Geert Wilders to become prime minister. Then we have the first round of the 2017 French presidential election which will be held on Sunday 23rd April 2017. Should no candidate win a majority, a run-off election between the top two candidates will be held on Sunday 7th May 2017. The last important European election for 2017 will be the German federal elections will elect the members of the Bundestag, the federal parliament of Germany, on Sunday 24th September 2017. Here the populist Alternative für Deutschland (AfD) is expected to do well. If the Editor was forced to put money on their chances, he would put money on Geert Wilders not becoming the next Dutch Prime Minister and Marine Le Pen not becoming the next French President. He would however put money on Emmanuel Macron becoming France’s next President. What is clear however is the effect earlier elections in other countries have on subsequent European elections. Whilst we can confidently expect Geert Wilders NOT to be the next Dutch Prime Minister, we can however expect the Partij voor de Vrijheid to do very well. This will undoubtedly help Marine Le Pen but the British Gazette still thinks that more French will vote for Emmanuel Macron in the second round purely because he is NOT Marine Le Pen. The one set of events that could change this would be a round of Islamic terror attacks in the Netherlands and France following the Dutch elections. This then is the backdrop to the UK’s Brexit negotiations! There would be some sound political sense in the House of Lords blocking the Withdrawal from the European Union (Article 50) Bill forcing Madam May to use the Parliament Act in October 2017. Then at least Madam May will know who she is negotiating with.